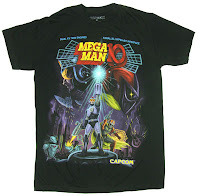 Leftmost shirt is interesting; it was once an event exclusive item, given away at past E3s, Comic-con and MM10's launch event at Nintendo World last year. It has since become something of a collector's item, usually going for a pretty penny on Ebay and the like. Thankfully, this one is a lot cheaper! The other shirt continues the tradition of sprite-based apparel with the usual cheeky one-liner. Nothing too fancy, but it'll keep you cool when the heat begins to kick it up. Where to buy? According to a couple readers, both shirts were recently spotted in-store at Hot Topic and Spencer's. When it comes to online retailers, it looks like MyTeeSpot's got your back, both available for $19.99 USD. Thanks to Jeni and RockX for the tip! Why is it when they make these shirts they feel the need to add some stupid little phrase. I dont need it to say "Made in the 80's" or "8-bit masterpiece". 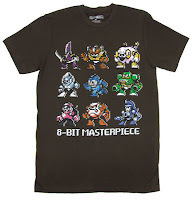 Why not just a shirt with the sprites on them. oh god. 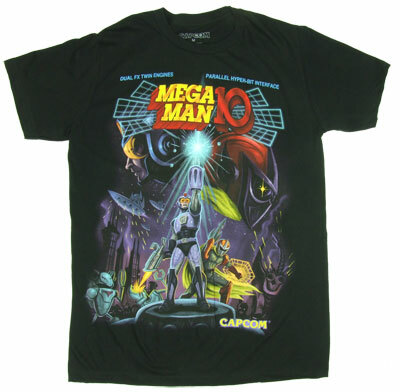 Even if I never plan on buying MM10.. there's so much want here.